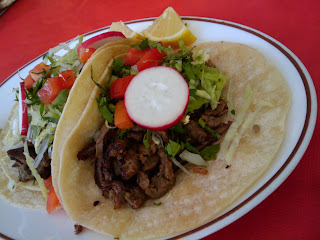 Taco NYC: El Paisa Taqueria & Restaurant 324 Suydam Street Brooklyn, NY 11237 (Bushwick) 718.417.4328 On the corner of Irving Ave. and Suydam St.
El Paisa Taqueria & Restaurant 324 Suydam Street Brooklyn, NY 11237 (Bushwick) 718.417.4328 On the corner of Irving Ave. and Suydam St.
Once in Colima my cousin Alejandro and I went to a taco stand and before I ordered he said to me, “order the al pastor.” I looked at him confused and he continued, “that’s what’s good here,” so I ordered four tacos without hesitation. What this taught me was that sometimes taquerias can serve 15 different tacos, but only one will be a perfect ten. Does this make the taqueria bad? Not really, I suggest you try a variety of things and see what works for you. Maybe you might find out that the tacos are not good but they serve an awesome bowl of menudo (aka pancita in some parts of Mexico) or their mole is out of this world. This is what happened at El Paisa, I ordered three different types of tacos, and the tacos Al Pastor (marinated pork) was a perfect ten. The steak and the beef tongue taco were… uneventful. Would I go back to El Paisa, of course I will, I feel that El Paisa’s strength lies in its other dishes. Next time I’m there I’m ordering chilaquiles. Directions: L Train to Dekalb Ave. Walk south on Dekalb Ave. to Irving Ave. make a right, walk two streets and it’s on the left hand side across the street from Bushwick Park. Hey, did you hear about the Tour de Taco coming up this Saturday? Im posting the link tonight. You should join! @"Underground Dining," yes I read about it on bikehugger.com I would join but I have no bike and they are mostly concentrating on Manhattan and Brooklyn. 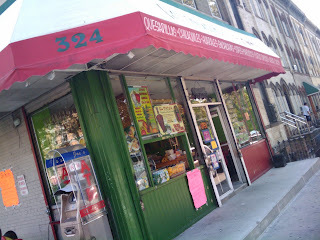 Queens has a a lot of Taquerias and someone just told me about a place in the Bronx.